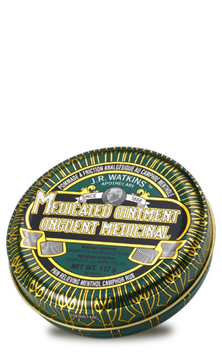 Watkins menthol camphor ointment or as it's often known medicated ointment is one of the essential products for your first aid kit and medicine cabinet. I'm often asked, "Do you have that Watkins ointment in the green tin?" I'm happy to reply, "Yes!" During cold season and all year round you'll want this cooling, soothing product that has been making people feel better for more than 85 years. Watkins menthol camphor ointment contains no turpentine unlike some competitive products. What do you use Watkins Menthol Camphor Ointment for? Shop for your Watkins Menthol Camphor Ointment in our safe, secure Watkins store or request your free Watkins full product catalog and order by mail or phone. If you found this page helpful please share it!